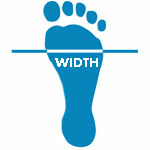 Most people don�t know that there is not a standard width system used by shoe manufacturers. Healthy Feet Store has put together step by step instructions to help you determine your proper width. Measure the width at the widest point (as seen in graphic). Locate your shoe size and find your measured width. Find the corresponding �Standard Width� at the top of the column. That is your width! For a more detailed explanation, please watch �How to Measure Your Feet At Home� video. Infant 1 17⁄8" 21⁄4" 27⁄16"
Infant 1.5 17⁄8" 21⁄4" 27⁄16"
Infant 2 2" 23⁄8" 29⁄16"
Infant 2.5 2" 23⁄8" 29⁄16"
Infant 3 21⁄8" 27⁄16" 25⁄8"
Infant 3.5 21⁄8" 27⁄16" 25⁄8"
Infant 4 23⁄16" 29⁄16" 23⁄4"
Infant 4.5 23⁄16" 29⁄16" 23⁄4"
Infant 5 21⁄4" 25⁄8" 213⁄16"
Child 5.5 21⁄4" 211⁄16" 27⁄8"
Child 6 25⁄16" 23⁄4" 215⁄16"
Child 6.5 23⁄8" 23⁄4" 215⁄16"
Child 7 27⁄16" 213⁄16" 3"
Child 7.5 21⁄2" 27⁄8" 31⁄16"
Child 8 21⁄2" 215⁄16" 31⁄16"
Child 8.5 29⁄16" 3" 33⁄16"
Child 9 25⁄8" 3" 33⁄16"
Child 9.5 211⁄16" 31⁄16" 31⁄4"
Child 10 23⁄4" 31⁄8" 35⁄16"
Child 10.5 23⁄4" 33⁄16" 33⁄8"
Child 11 213⁄16" 31⁄4" 31⁄2"
Child 11.5 27⁄8" 35⁄16" 31⁄2"
Child 12 215⁄16" 33⁄8" 39⁄16"
Youth 12.5 3" 37⁄16" 35⁄8"
Youth 13 31⁄16" 31⁄2" 311⁄16"
Youth 13.5 31⁄8" 39⁄16" 33⁄4"
Youth 1 33⁄16" 35⁄8" 33⁄16"
Youth 1.5 31⁄4" 311⁄16" 37⁄8"
Youth 2 35⁄16" 33⁄4" 315⁄16"
Youth 2.5 33⁄8" 313⁄16" 4"
Youth 3 37⁄16" 37⁄8" 41⁄16"
Youth 3.5 31⁄2" 315⁄16" 41⁄16"
Youth 4 39⁄16" 4" 43⁄16"
Youth 4.5 35⁄8" 41⁄16" 41⁄4"
Youth 5 311⁄16" 41⁄8" 45⁄16"
Youth 5.5 33⁄4" 43⁄16" 43⁄8"
Youth 6 33⁄16" 41⁄4" 47⁄16"